Just behind the Museumsquartier, in a Viennese district famous for its art galleries, the modern and creatively adapted lounge "Art & Design Space" has been installed. During the opening of the Gallery, Ina Golub introduced to a selected audience a selection of works from her series "Portraits of New York". The artist, who lived for more than 50 years in that city, was able to reflect her New York experiences in her works. Subsequent to the opening of the Gallery, Ina made available to the young artists a properly conditioned space to allow them expose their works to the public at an earlier age as she could present her art to the world due to the circumstances she had to overcome. Ina was always interested in maintaining a dynamic, didactic and respectful interaction with the exhibitors through their works. The gallery provided her the opportunity to help young plastic arts artists to achieve their dreams. Ina Golub began to paint much later than she wished to do so, however; she knew she wanted to be a painter already at the “early age of 2 years old” (according to her own statement). Thanks to an outstanding permission, Ina Golub joined the Vienna Academy of Art for Women (Wien Frauenakademie) at the age of 15. In the Academy she benefited from the experiences of the well known artists Ferdinand Kit, Ferdinand Brunner and Bertold Löffler. She also had the opportunity of learning the porcelain painting among other artistic disciplines. Later Ina worked as “extra” in the Wien-Film GmbH (Vienna Film Limited) and after that as correspondent in a fashion magazine in Berlin. In 1945, she accompanied her first husband Sergej, architect by profession, to Munich and subsequently traveled with him to the United States. After her divorce in 1955, Ina dedicated all her efforts to the domestic lighting business. In this field Ina won a prize as successful designer. Motivated by this achievement Ina inaugurated the lamps and lighting company "Brite Lite Lamps Corporation" and opened a "flagship" shop in the famous Fifth Avenue in New York. In 1965 she married Lenny Golub, the owner of the firm. Together they used to travel on annual basis to Florence to purchase luxurious porcelain utilized by the artist and her team to design the exquisite lamps that were sold in their store. The work in the company did not provide Ina with the free time she needed for painting and it was only after the sale of the company at the end of the 1970s, when Ina could devote herself entirely to her passion. Mr. Golub passed away in 2002. Ina Golub painted everything that drew her attention at very high technical level and with precise observation power. The characters represented in her paintings faithfully portray the real New York City life. There are no preconceived selections of faces and situations in her paintings. 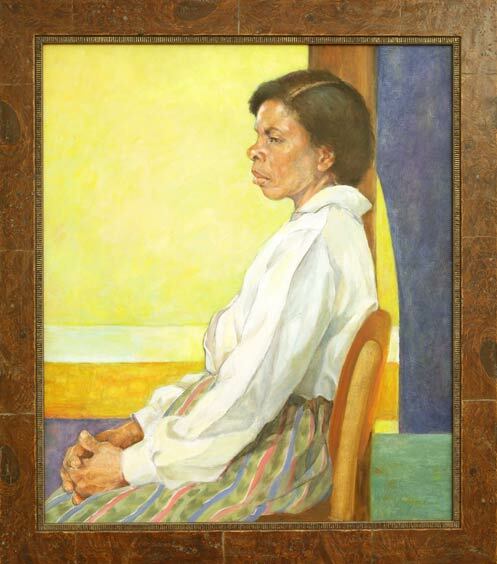 We could see portrayed in Ina´s paintings a “white and angelical New Yorker princess” and also a variety of expressions of beautiful mature faces belonging to a champion of American softball or to a militant lesbian. 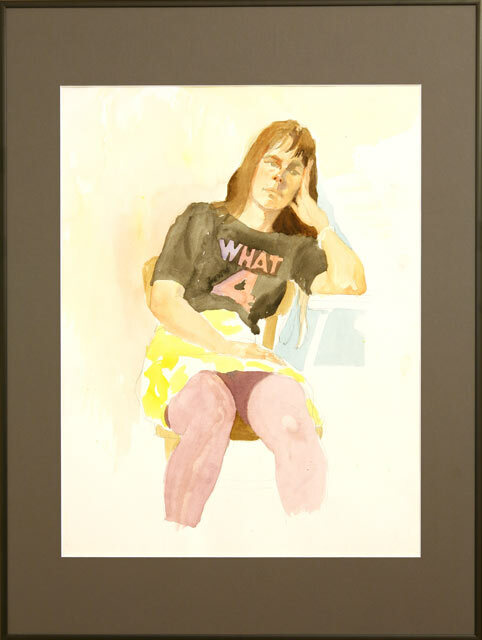 Ina´s paintings recreate all American outlooks and social classes including white and black. Golub studied her models with the skills and the experience of an intelligent, knowledgeable and overwhelm with love worldliness woman. Her brushstrokes precisely reflect what they see and sometimes with a slight and refined ironical inflection. For more than 20 years Ina recreated us with watercolors, pastel paintings, drawings and large formats oil paintings full of strong and bright colors. Ina Golub prefered a figurative and dense, infused with vibrant colors painting style. This form of painting has been fashionable for years, adopted primarily by young representatives of contemporary art as opposed to abstract painting that had prevailed for several decades. In Ina works can be seen the interlacing impressions of the "New Realists", meticulous and loyal exhibitors of the Americans´ daily life. Ina´s pictorial work has been recognized by the American public. Ina organized exhibitions at the Metropolitan Art Museum and in the Modern Art Museum in New York, and also in the Nassau Art School. Some of her works are included in various private American Art Collections (Resenberg, Liechtenberg, Kramarsky). With the opening of Golub Art & Design Space Ina could finally present her paintings to the Austrian public and fulfill her entire life dreams. Ina Golub´s return to Vienna: The beginning of her second career at the age of 81! - American Style Golub Art & Design Space, Breitegasse 19, 1070 Wien. -Shows that "elderly persons" are not in any way "as old" as the society generally would like them to believe. -Helps to promote young artists in their hometown, contributing with her personal initiatives with commitment and always looking beyond her own work. Throughout her life Ina Golub dreamt of making a successful career in the field of art. Only after many years abroad upon the return to her homeland these dreams could be achieved. Ina made efforts to work in her own paintings and above all to enthusiastically promote the careees of young artists. Ina Golub was 84 years old when she passed away in 2010. Golub Art & Design Space would continue Ina`s work initiated in her honor and now among other activities, would successfully disseminate young contemporary Cuban artists´ works.